Josie's Juice: 'A Culturally Diverse Comedy Night': Ticket Giveaway! 'A Culturally Diverse Comedy Night': Ticket Giveaway! On the eve of Cultural Diversity Week, internationally renowned performer Joe Avati will head a line-up of comedians for a special show to help raise funds for anti-bullying organisation, Bully Zero Australia Foundation. Reflecting on his own experiences of being bullied in the schoolyard because he was called Giuseppe (he could never find a mug with his name on it! 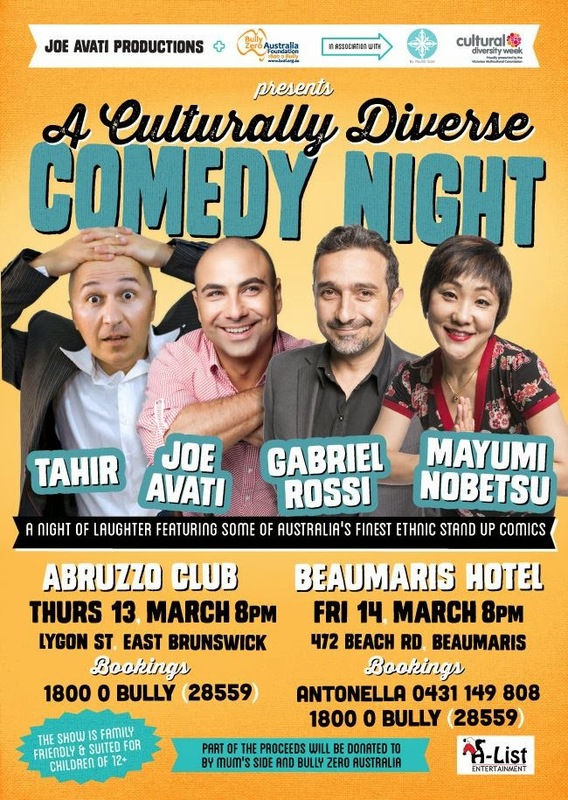 ), Joe has teamed up with fellow comedians Tahir, Gabriel Rossi, and Mayumi Nobetsu to put on a fantastic night of stand-up comedy to give a boost to a very worthy cause that has not only affected one in five Australians, but has impacted all four stand-up comedians. A credit to this kind of comedy, where they recount stories of their upbringing with humour, is that it has the very opposite effect of bullying, and that is of celebrating different cultures and promoting unity”. Adds Joe, with a laugh, “I was bullied because of my ‘stinky’ lunch. Mum would make me a sandwich of white bread with salami. My friends had hundreds and thousands on their bread, while we had hundreds and thousands under the mattress," he quips. Melbourne-based comedian and father of two, Gabriel Rossi, has been on both sides of the fence, but concedes either position is one he’d want to see his children in. “I embarrassed this one kid in front of the entire class once. But he got me back by waiting for me outside the front of the school for weeks. I ended up having to sneak out of school another way”. Showing bullying exists everywhere, Japanese-born comedian Mayumi Nobetsu had her fair share of it, too. “In Junior High School, more traditional girls treated me like I was different. One particular girl started to convince all of my friends to hang out with her, which meant I was alone during recess and lunch breaks. After a while, I decided to read up on bullying, and I understood that people bully because of jealously, insecurity and immaturity. Fortunately, once I entered senior high school, the bullying stopped”.